Finally, I can say that I HAVE played the Harry Potter Clue game and that I have LOVED it. (And not just because I won, either!) During our first game, Aunt Robin drank a potion that she shouldn't have and was dead before she knew what had happened and then, my son was taken out by a fire-breathing dragon, leaving me the winner. I hadn't yet solved the mystery of who kidnapped Neville Longbottom but I'm sure I would have eventually. Harry Potter Clue is a fantastic board game and quite probably as one of the best Harry Potter games. It was on my Christmas wish list and I was thrilled when my teenage boys received it from their Grandparents. The magic and mystery of Hogwarts IS the perfect setting for a Clue game and all of the characters, potions, spells and locations are familiar to Harry Potter fans. The game was fun and it lived up to all the wonderful reviews I had read about it. Harry Potter Clue is recommended for individuals 9 years of age and up. What Is Harry Potter Clue About? 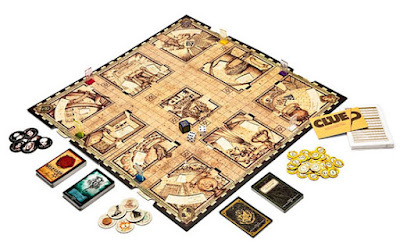 In Harry Potter Clue, you discover the secrets of Hogwarts. A student has disappeared and you have to solve the disappearance. The game is played by moving around the board and making suggestions but, as you might expect at Hogwarts, you have to be careful of wheels that reveal secret passages, hidden staircases and even the Dark Mark. In the end, you must go to Dumbledore's office to make your accusation. Amazon says that "kids love taking on the roles of their favorite characters." Not only did my son love doing so but I did, too! Amazon customer reviewer Isabella says she likes this game better than the original version of Clue because of the different twists. Janis says that this game is different because of the house points that can end the game when you least expect it. She lets us know that you don’t have to be a Harry Potter to enjoy the game but, of course, fans will enjoy it even more. It’s a game of skill and luck and definitely recommended by Janis. Christopher Ingle says he wasn’t keen to play a remake of Clue but that once he had played he was hooked. I agree with all of those reviews and can highly recommend this game. It is a fabulous idea for a Christmas or birthday present for any Harry Potter fan or for your HP collection. 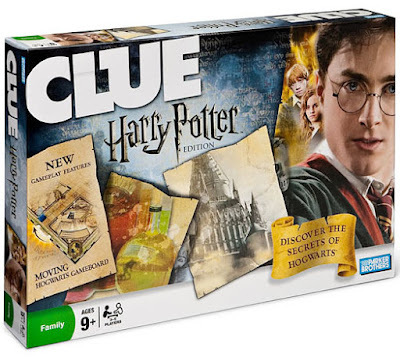 You can click order this Harry Potter Clue game from Amazon by clicking here. However, you should be aware that there is a new 2016 USAopoly version that I understand plays pretty much exactly the same. You can find the newer 2016 USAopoly Harry Potter Clue game here. Do you love the game Clue? Are you a big Harry Potter fan? If you answered yes to either of the first two questions, you should definitely be checking out this board game! Note: This post originally published elsewhere by the author in 2009.